Happy Monday. Where did the weekend go? Brian worked most of the weekend. Austin and I spent the weekend inside cuddling on the couch watching Hallmark movies, and playing with all his toys, and I mean all his toys. I really had a boring weekend, but I am perfectly ok with that. We both needed a break. 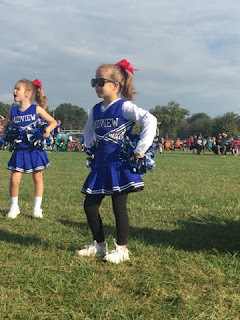 I did have Ella's cheerleading game on Saturday morning. Brian and Austin stayed home. There is only one week left and 2 games, one game tonight and the last game is on Saturday on the high school field. I am excited and sad to see it come to an end. Ella is excited because she really doesn't like going to practice, she just wants to cheer at games. She also hates not having time to play on Monday's when she has practice. She doesn't get home from school until after 4, we have dinner and are back out the door before 6, half an hour drive to cheer, practice for an hour, and a half hour drive home. We get home around 8 and it is time for a bath and bedtime routine. Makes for a long Monday. I did have a little excitement of an impromptu date night on Friday. I asked my sister if she wanted to watch Austin for a few hours and she agreed. I had a good excuse to get dressed up and put on make-up again. I have a love/hate relationship with ads in my e-mails for restaurants. I got one from Yard House the other day, made the mistake of reading their beer specials and all I could think about was one beer that caught my attention. 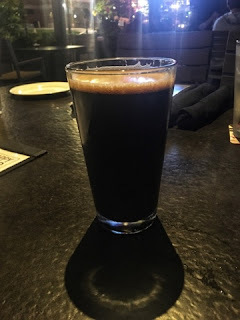 Founders Breakfast Stout. Rich Sumatra and Kona Coffee Chocolate Stout. I was intrigued with Kona Coffee and Chocolate. I use to hate and I mean hate beer. I have become more adventurous with trying different beers. I have found a lot I love and a lot I also hate. Stouts are one of my favorites. This one was delicious. Brian and I decided to try something different and out of our norm for an appetizer. Normally we get Poke Nachos or Poke Stack which is raw ahi, and OMG is it delicious. I never thought I would say I love something raw. 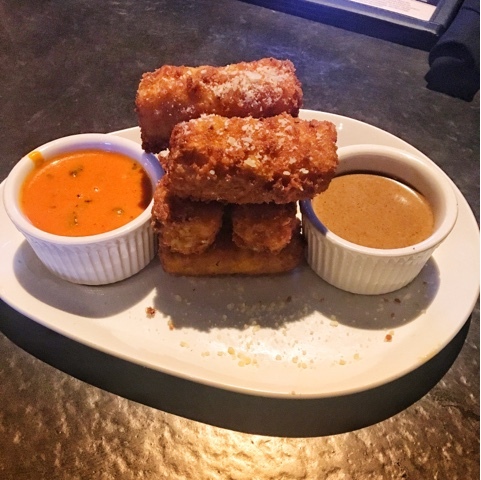 We decided to try Fried Mac + Cheese. It came with a side of tomato bisque and porcini cream sauce. The mac and cheese itself was very flavorful. It was a little greasy for my liking, especially since we barely ever eat anything deep fried anymore. The tomato bisque was also delicious. I wish I had a spoon to eat the rest of it. I have no idea what porcini cream sauce but it was disgusting. The texture reminded me of a mustard, but had a very weird flavor. For my dinner I got a roasted turkey club. 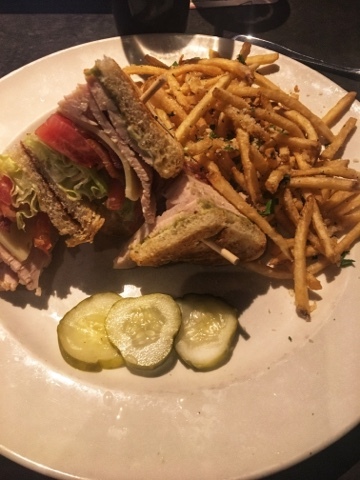 You can never go wrong with a club sandwich. It also had crushed avocado on it which makes it a million times better. I opted for the up charge and got truffle fries. I can't pass up truffle fries. 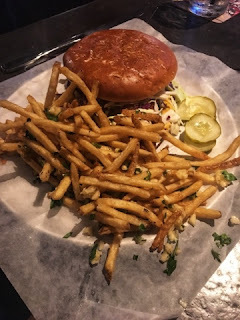 If you have never had truffle fries you really need to try them, you will also be addicted. Brian's dinner choice was the Nashville Hot Chicken sandwich. It was a crispy all white meat chicken breast with spicy sweet slaw and aged white cheddar spread. Brian liked it a lot. It wasn't overpowering with spice and had great flavor. He got garlic fries that he also enjoyed but admitted that the truffle fries were better. 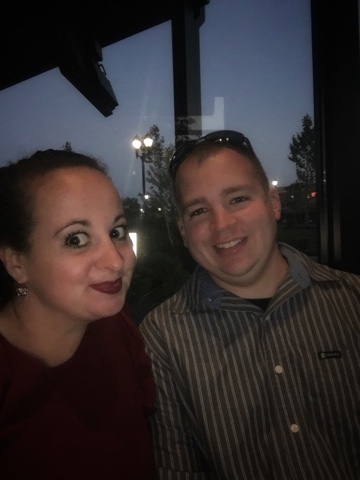 I have to give a shout out to our amazing server, Christian. He had such a bubbly personality and really knew his beers. Yard House is known for having over 100 of beer on tap that change frequently. He made great recommendations for us to try and picked a great one for Brian. Friday night was a little chilly but we sat outside on the patio anyways. To my surprise as soon as I started to get a little chill the outside heaters turned on. It was like magic. Made for the perfect evening. Hope you had a wonderful weekend. We have another busy week ahead of us. 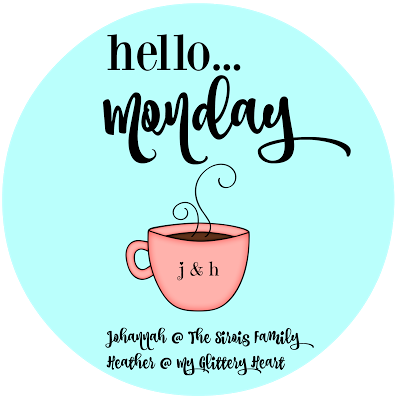 I am linking up with some great gals for Hello Monday!